I can’t be the only adult out there that loves playing with Dry Erase markers. There’s something about the way the pens smoothly glide across the surface of the board that makes them fun. When I first got my dry erase board, I also bought an Expo Dry Erase Marker kit that included 8 chisel markers, 5 fine markers, an eraser, and a bottle of spray cleaner. I had the standard colors of red, blue, black, green in both marker sizes and I thought I was getting exotic with a purple, orange, brown, and yellow. Well, if those colors are exotic, then the new Expo Dry Erase markers colors are out of this world. Since then, Expo has come out (or maybe they always had them and I didn’t see it) with more vibrant color options that can be used for learning or for fun! 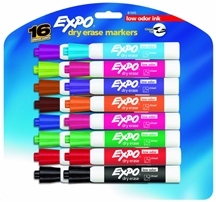 The Expo Low Odor 16-pack Chisel Markers come in 16 colors, including, pink, lime, turquoise, aqua, and light blue. 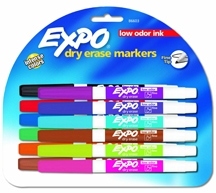 The Expo Low Odor 12 Pack of Fine Markers has 12 colors, which match colors from the Chisel Marker Pack. The Expo Low Odor Markers draw VERY well. The ink comes out smoothly without any bleeding. I loved how you could use the chisel marker and rotate it different degrees to make different thicknesses of lines. So with one Expo Chisel Marker, you could do thick, medium, and thin lines. 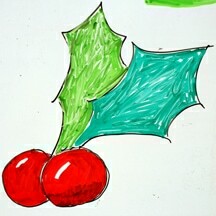 For the holly drawing, we used the fine marker to create the outline, and then the chisel markers to fill. 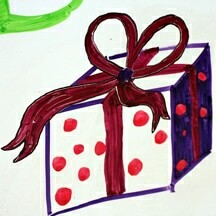 On the gift box, I used the chisel markers to create the shapes and fill, then used the fine markers to highlight the ribbon. There are so many different ways you can draw with the markers, and now with so many different colors, the drawing options are endless. These markers also are true to their name with virtually no odor. I had to stick them within inches of my nose to be able to smell anything. Between stages, we used the Expo Microfiber Dry-Erase Board Cleaning Cloth to clean the board. There are a couple of things I really like about the Expo Cleaning Cloth. First – you can wash it. That means this can be the last dry erase eraser you’ll have to buy because when it starts leaving little bits of marker pieces on the board, simply wash it. The other thing is that I thought it erased more effectively than the other soft-bristle type eraser (that looks like a chalkboard eraser.) With those erasers, it wouldn’t always erase with one swipe of the eraser, and it would frequently leave, what I’ll call “marker-dust” at the end of the swipe. Good luck getting rid of the marker dust if it’s permeated your eraser. With the Expo Microfiber Dry-Erase Board Cleaning Cloth, just fold to a fresh piece of cloth and it’ll clean the marker-dust right off. Once you realize that you can use dry-erase outside of the conference rooms, a world of possibilities open up. The Expo Dry-Erase Learning Board can help your kids practice their writing skills without having to go through tons of paper. 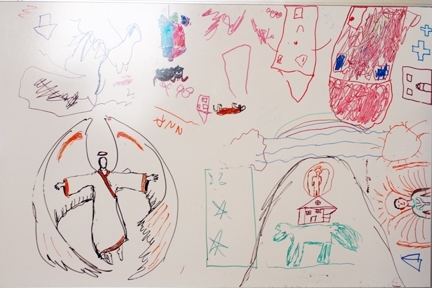 A dry-erase board and any of the Expo Marker packs allow them to be creative and draw as much as they want. And since the Expo Low Odor Markers are Certified AP nontoxic, they’re safe for most ages to use (but I’d still supervise the younger ones anyways.) For us adults, we can use it to track things we need for the grocery store, errands, important dates, giveaways — the list goes on! 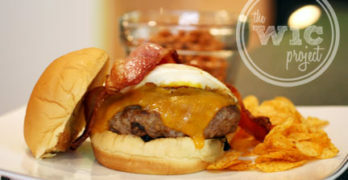 Expo offers many products under $20 that won’t put a huge dent in your wallet this holiday season. 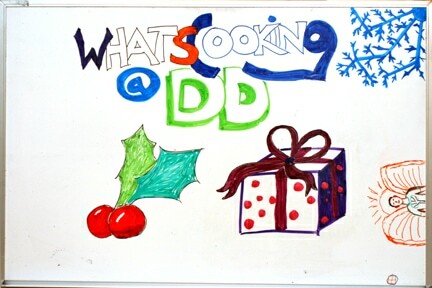 They are also part of the What’s Cooking at DD Holiday Gift Pack Giveaway!